The classic 1953 drama/thriller from Japanese director Mizoguchi Kenji, Ugetsu monogatari (雨月物語, Tales of Moonlight and Rain) was taken from a pair of 18th century Japanese ghost tales by Akinari Ueda. The Silver Lion-winning (Venice Film Festival 1953, Best Direction – no top honor, Golden Lion, was awarded that year) film is a classic of Japanese cinema. Steeped in traditional Japanese artistry with allusions to Noh (能) and samurai honor, it’s an intriguing and riveting tragedy renowned for its camera work made up of long takes and its detailed reconstruction of 16th century Japan. The story, set during Japan’s 16th century civil war era, follows two married men, the simple potter Genjūrō (Masayuki Mori) and aspiring samurai Tobei (Ozawa Sakae). When their village is invaded by unruly samurai hordes, the two men rescue the pottery from their partnered kiln and set out with their wives dreaming of the riches and military glory it will bring them in the big city. In two parallel stories, we see how they are both separated from their wives by the pursuits of their dreams. Genjūrō is lured away by the beautiful, but mysterious and ghostly Lady Wakasa (Machiko Kyo) to her empty and tragically dark estate while Tobei purchases a suit of armor and pursues his dream of military glory. All the while, their wives are driven into tragic circumstance due to their choices. The film can be seen as a parable on the ravages of war, the conceit of men, and the politics of gender. Its combination of real world consequences with the supernatural was seamless in its execution so much so that the seemingly happy ending with Genjūrō turns out to be much more tragic than it at first seems. Mizoguchi was already well established by the time he made Ugetsu and had been greatly admired by other younger directors of the era, including the great auteur Kurosawa Akira. 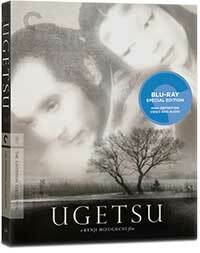 This new 4K digital restoration was supervised by Miyajima Masahiro and Martin Scorcese. The 4K transfer was undertaken from a 35mm fine-grain positive and a 35mm duplicate negative at Cineric, Inc. by The Film Foundation and Kadokawa Coporation with funding from The Hollywood Foreign Press Association. The film arrives on Blu-ray Disc from the Criterion Collection in a beautiful AVC 1080p eoncodement framed at its original 1.37:1 aspect ratio. Source damage is minimal, the grain structure is intact and looks natural and organic without being overwhelming. Blacks are not absolutely inky, but more than dark enough given the age and provenance and detail is quite crisp. The original monaural soundtrack was remastered from a 35mm optical soundtrack print and restored by Audio Mechanics in Burbank, California. The sound is a little boxy, but it is intelligible and clean with minimal hiss and pops. This is where Criterion really steps up. Although the on-disc special features are mostly port-overs of previously available featurettes, for those who have not seen or heard them before, this is high quality material featuring plenty of interviews and an over two-hour-long documentary on the filmmaker. The always-informed Tony Rayns provides a strong audio commentary, recorded in 2005. The provided book is one of the better ones from Criterion Collection, weighing in at 72-pages, it features an essay plus the short stories that inspired the film. 72-page book featuring an essay by film critic Phillip Lopate and three short stories that inspired the film. Commentary featuring filmmaker, critic, and festival programmer with a special interest in East Asian cinemas, Tony Rayns, recorded in New York City in June 2005. Masahiro Shinoda (1.78:1; 1080i up-scaled; 00:14:09) – The director of such classics as Pale Flower (1964), Samurai Spy (1965), and Double Suicide (1969), considers Ugetsu one of cinema’s crowning achievements. This interview took place in Tokyo in May 2005. Tokuzo Tanaka (1.78:1; 1080i up-scaled; 00:20:13) – The first assistant director on Ugetsu, Tokuzo Tanaka would go on to direct several films in the famous Zatoichi series, starring Shintaro Katsu. This interview with him talking about his work with director Kenji Mizoguchi took place in Tokyo in May 2005. Kazuo Miyagawa (1.33:1; 1080i up-scaled; 00:10:32) – One of cinematography’s finest talents, Kazuo Miyagawa shot a number of Japan’s most celebrated films, including Akira Kurosawa’s Rashomon (1950); Kenji Mizoguchi’s Ugetsu (1953), Sansho the Bailiff (1954), and Street of Shame (1956); and Yasujiro Ozu’s Floating Weeds (1959). This interview was recorded in 1992 for the Criterion Collection laserdisc release. Kenji Mizoguchi: The Life of a Film Director (1.33:1; 1080p/24; 02:29:54) – This 1975 documentary offers an extraordinary look at Kenji Mizoguchi’s thirty-year filmmaking career, from his beginnings in the silent era to his international success with late masterpieces such as Ugetsu and Sancho the Bailiff. Director Kaneto Shindo (The Naked island, Onibaba) presents dozens of interviews with Mizoguchi’s friends and collaborators, including his muse Kinuyo Tanaka, cinematographer Kazuo Miyagawa, and longtime producer Masaichi Nagata. The Criterion Collection have gone all out for this classic of Japanese cinema. It has never looked better. It bests the Masters of Cinema release from five years ago in both picture quality and included special features. All cinephiles should have a copy of this complex and nuanced film in their collection, particularly this Criterion Collection edition. Greed, conceit, gender and class disparities, and the supernatural combine in this nuanced parable from the great Japanese auteur Mizoguchi Kenji -- beautifully restored in 4K and brought to Blu-ray in a new feature-rich edition from the Criterion Edition.